I’ve always considered Avenged Sevenfold a relatively inconsistent band, in the sense that I’ve always thought that a few solid tracks define their albums, with the other tracks being weak in comparison. I hoped that ‘Hail To The King’ would break this chain and be an album that substituted these few stronger songs for a consistently good record. This is certainly true of the bands sixth studio album which works very well as a whole, delivering a more refined and confident sound. 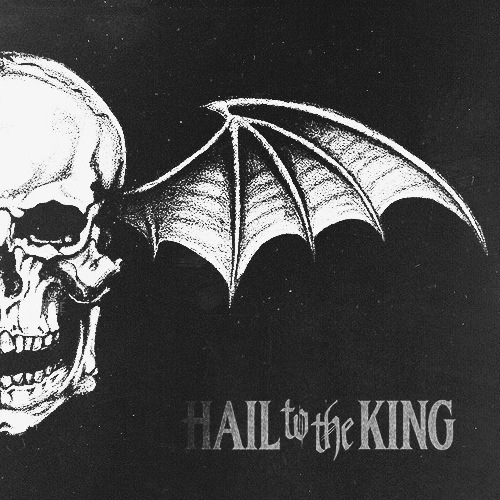 ‘Hail To The King’ is more of a dynamic listening experience than past Avenged Sevenfold releases, and it’s one that is designed for stadiums, being a more cinematic and controlled release. As a result it loses some of its creativity, which could be a result of lacking Jimmy ‘The Rev’ Sullivan. Thankfully Arin Ilejay does a great job, and he brings a much more structured delivery, especially on opener ‘Shepherd Of Fire’ by supplying a basic, toe tapping pattern which features often across the ten tracks present. The album is less instrumentally adventurous, relying mostly on riffs to carry songs, with numerous guitar solos throw in. This isn’t a bad thing, as it introduces an element that Avenged Sevenfold have been previously lacking and as a result ‘Hail To The King’ is a very self-assured album that chugs along with a certain kind of swagger (especially on ‘This Means War’), which gives it its bite and impact. It’s a huge step in the right direction, and the band know it. The album still contains aspects of classic Avenged Sevenfold, most noticeably M Shadows’ distinct and powerful vocals which are very good, despite having their weaker moments. His trademark growl kickstarts ‘Doing Time’, a track bristling with the venom we’ve come to expect from the band, and includes some of Ilejay’s most adventurous drumming, and an excellent guitar solo from Gates – who has stepped up to the task of lead guitarist brilliantly on ‘Hail To The King’. For me, ‘Coming Home’ was the albums best track, merging old and new, with a superb chorus. It summarises the record and its intent, showing clear progression from past work. The album still has its ‘softer’ songs- ‘Crimson Day’ and closer ‘Acid Rain’ which are a welcome change in sound, showcasing vocals and a talent for writing powerful songs with a more stripped back approach. There’s a relatively good mix of sounds on ‘Hail To The King’ borrowing from older bands like Metallica and adapting them for a more modern approach. It makes for an entertaining listen that does occasionally becomes a little repetitive, due to a somewhat loose formula being followed across the albums 53 minute length. Ultimately, ‘Hail To The King’ sounds more mature and concise. It still lack lyrically but has more ‘drive’ than anything the band have released, finding a sound that works and pushing it as far as it will go. It’s exactly what I hoped it would be, and should please fans old and new by finally reaching the highs past releases have failed to. Hi,I check your blog named “Avenged Sevenfold – Hail To The King (Review) – Craig Reviews Music” like every week.Your humoristic style is witty, keep it up! And you can look our website about free anonymous proxies.